Dental hygiene is of utmost importance the minute your baby sprouts the first set of teeth. You may start using a finger brush to brush your baby’s teeth and later on start using a proper brush and a toothpaste. Toothpastes help in keeping the teeth and the gums healthy. 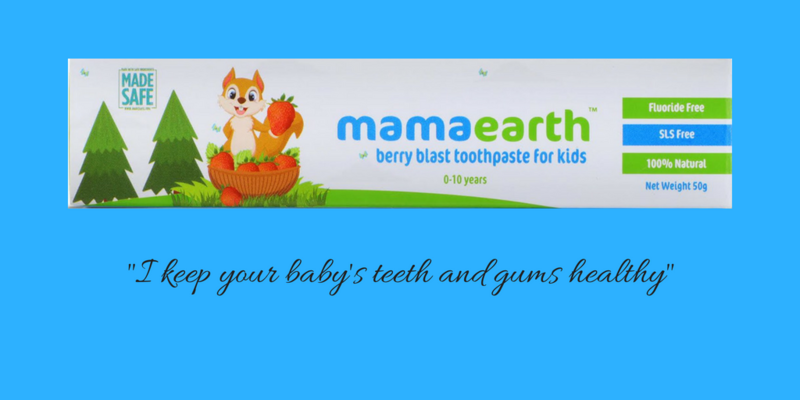 It would be a good idea to use a fluoride free toothpaste like Mamaearth Natural Berry Blast Toothpaste. My toddler has been using it since a month now and I am glad that he likes the taste. Brushing is so much fun now. This new product from mamearth claims to be a safe toothpaste for babies. It is 100 % natural toothpaste and toxin free. As it does not contain fluoride or SLS, it is safe even if the child ingests it in small quantity. Young kids take sometime to learn how to gargle and thus sometimes eat the toothpaste. We loved it fruity taste. Water, Hydrated Silica, Glycerin, Sorbitol, Xylitol, Aloe Barbadensis, Lauryl Glucoside, Cellulose Gum, Natural Strawberry Flavour, Stevia. Make sure that your child brushes his teeth every morning & evening, or after every meal. Children under 5 years should use only a pea-sized amount of toothpaste. They must be supervised while brushing to minimise swallowing. Gently brush gums & teeth in circular motion. Tastes good and thus the child likes to brush his teeth. Contains high quality ingredients like Xylitol, Aloe and Stevia. Xylitol, natural plant ingredient, protects the teeth from tooth decay and plaque formation. Aloe Vera Gel relieves sore gums when the new teeth come through. This is a safe toothpaste for children. My son is 20 months old and we used small quantity of the toothpaste. He still does not know how to brush his teeth so we brush them for him. I am glad that Mamaearth came up with a 100% natural toothpaste for kids. Brushing is now fun and worry free. This is one of the few Mamaearth products I am yet to try but your review looks promising. Will definitely be trying it soon. Its definitely one of those yummy bubblegum sort of toothpaste that children love to, well gulp. My daughter loves it and I am not worried even if she gulps. Mama Earth surely is a great brand for kids’ products. Will try their toothpaste. Thanks for sharing. Oh I had been waiting for an organic and natural baby brand to come up with toothpastes for kids! Surely going to grab one …looks like a great product! Would love to try this product, its amazing that its organic and we don’t have to worry if the little ones swallows it too. Thanks will have a look at their website. Thanks for this review! I have been wanting to try Mamaearth products for the longest time! Definitely trying this one now! This toothpaste is amazing. We still haven’t finished our tube.